Is Youth Wasted On The Young? As I mentioned in this post, I have been writing in a journal since I was a teenager. As I saw today’s prompt, youth, I was reminded of a journal entry I wrote not too long ago. I just finished walking Lotis. We walked for 1.8 miles and I could barely do it. In addition to that, I often felt disappointed in myself because I had such a hard time. It is so hard to conceive that I used to be able to run for an hour straight. Now, I can barely even walk my dog. Right now, I just got back from taking Maddy down the block and back. She has slowed down tremendously. She was exhausted by the time we got to the corner. It pulls at my heart to see her hopping and trying to get momentum. There really is some truth to the saying that dogs mirror their owners. This makes me question the validity of sources that say age is all in the mind. They claim that with positive thinking, proper nutrition, and exercise we can defeat aging. I mean, look at Maddy. She doesn’t have to filter her thoughts to weed out negativity in the attempt to prolong aging. She has no choice in the matter. I think the same is true for us. Sure, we may be able to have a positive attitude about aging. And that may make the process easier. But, it doesn’t change the fact that we all age. We all will die. That’s why it’s really is important to live life to the fullest. You only get one chance in life. And that chance is short. When you look back at the years gone by, you realize just how short it is. I do hope I get the chance to send a message out to the youth of the world. Take the bull by the horns! Part of me wants to deny that I feel some regret. But, the truth of the matter is, I do. I have some regret for not doing the stuff that is in my heart. I’ve oftentimes heard the saying that youth is wasted on the young. I do not agree with this. It’s only wasted on the young who live in fear. The fear of stepping outside of the comfort zone of what they know. I am not completely filled with regret for the things I have not done. There have been some wonderful experiences in my life. I have met some incredible people. The person I am now is shaped by those experiences stored in my memory banks. There’s still hope. I pray that I get to leave a message for my brothers and sisters on this earth plane. I let it be as God deems fit. All things work out for the highest good. And so it is, Amen and Amen. This is a glimpse into my mind and my desires. I do try to relay the message of living with passion to the youth I encounter. I just want to do it on a larger scale. And not only for our youth, but for all. As I said, there’s always hope. 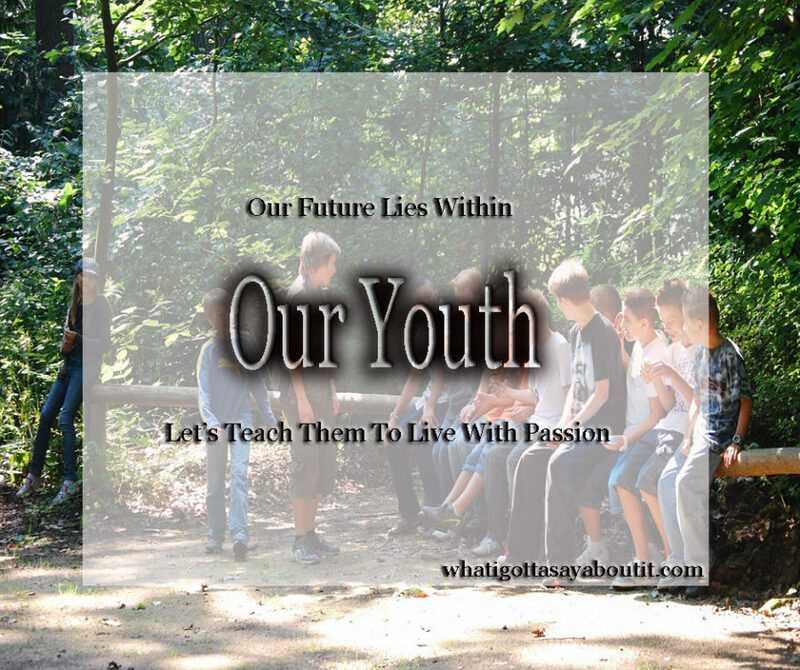 Is there a message you want to send out to our youth? Do you feel the urge to do something that matters? We would love to hear what you gotta say, so please feel free to share in the comments section below.